If there’s one thing you can do to make your accounts unhackable, it’s 2FA. Two factor Authentication, also known as 2FA, or two step verification, is an added layer of security known as Multi Factor Authentication. In today’s world of increasing digital crime, 2FA is an absolute must for any high profile online accounts. 2FA doesn’t just require your password, but also an additional randomly generated code that changes every 30 seconds that you usually access through your phone. This means, that if a hacker does get access to your password, they would also need to physically have access to your phone, and phones pin/passcode/fingerprint, to get in, making any unauthorized access practically impossible. I could practically tweet out my Gmail password, but without physically having access to my phone & my pin, that password is useless. This stops almost all hackers immediately, and renders your account inaccessible to outside attackers. If you don’t use 2 Factor Authentication, assume that at some point in the future your account will be compromised. 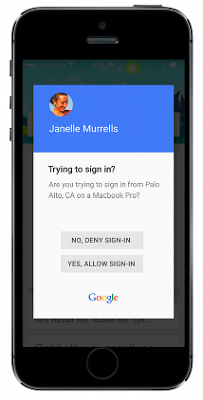 To start using 2 Factor Authentication, you will need the Google Authenticator app. This is the app that will be providing you with your 2nd authentication point. Download for Android or iPhone. Although Google has moved away from providing a code, and now prompts you instead if you want to authorize a login, like in the photo above. There are a variety of ways that you can provide your second authentication point, Twitter & Facebook like to send you the code via SMS to your phone, but I recommend the app. You can also use a security key, which we will be discussing in a later post. Most popular websites and services now offer 2FA, and I highly recommend you set them up on any accounts that do provide it, especially email accounts, social media, and banking sites. Check out this neat site, TurnOn2FA.com to help guide you through turning on multi factor authentication on several popular services.